GIVE IT TO: anyone! This one has mass appeal for all ages! SUMMARY: Ivan is a silverback gorilla who has been living in the Big Top Mall for the past 27 years. He hasn't seen another gorilla or even been outside since he was very young. His friend and cage-neighbor, Stella the elephant, is injured, and Ivan worries about a new baby elephant just brought in to replace Stella. 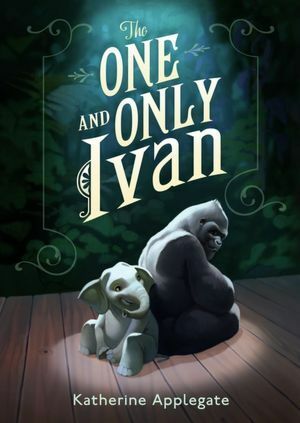 As a mighty Silverback, Ivan knows it's his job to protect his "family," but how can a mall gorilla save two elephants? REVIEW: I don't think I can really say anything that hasn't already been said about this book. It is excellent, but you probably already knew that. It won the Newbery for 2013, but you probably already knew that, too. It is sad and sweet and hopeful, all at the same time. Ivan broke my heart and put it back together again. If you haven't read Ivan yet, you really need to do that. It's a short, easy read that would make a great read-aloud to children as young as maybe 5. I plan to read this to my boys, ages 6 and 8. Instead of writing a review and repeating all that others have already said long before me, I thought I would put some links together that could be used to supplement this book in a classroom or library. I am also going to plug Suzy Red's website "Kid's Wings", which has an Ivan section with lots of links as well. Her most recent book, Growing Young Americans includes a huge spiral book, plus a CD and school site license to use something like 900 activities for $69.00. If you are an elementary or middle school teacher or librarian, you will use these activities--Suzy Red is amazing! THE BOTTOM LINE: Read it! This is absolutely essential for any library. Also a great read-aloud for the little ones. I suppose it is because my kiddos are a bit older, 14, 11 and 10, but I have never heard of Ivan. I am definitely going to go check this one out. Thanks for sharing all of the links. Much appreciated.